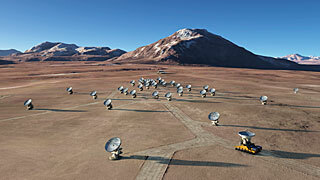 When the construction of Chile’s football field-sized telescope (European Extremely Large near-optical/infrared Telescope, E-ELT) and radio telescope network (Atacama Large Millimeter/submillimeter Array, ALMA) are completed, Northern Chile will be by far the most brilliant place to study astronomy. Not only does Chile offer a view of a different sector of space than the United States and Europe, but the clear skies and dry air of the Atacama Desert do not interfere with wavelengths reaching earth from outer-space, providing Chile with ideal conditions for star-gazing. Even now, the Northern hemisphere cannot compete with the astronomical successes achieved by European Southern Observatory sites in Chile at La Silla, Paranal, and Chajnantor. Announced in September was the new discovery of 50 planets outside of our solar system, 16 of which have a mass that is greater than, or at least equal to that of Earth. In addition, astronomers in Chile calculated the age of the Milky Way’s oldest star to be 13.2 billion years. Chile has made significant celestial discoveries and will continue to do so with the start of the new projects and development of innovative technology. Henri Boffin, astronomer at the Paranal Observatory insists, “If you want to do modern astronomy and you want to do it in the southern hemisphere, you have to do it in Chile.” Chile will continue to be on the global radar as the world’s most unique and valuable place to study extraterrestrial matter.